Oklahoma Connection | Norick was born in Oklahoma City, Oklahoma to James H. and Madalynne Norick. When the Murrah Federal Building was bombed on April 19, 1995 and 168 Oklahomans lost their lives, then Mayor Ron Norick was on the scene immediately and remained there tirelessly through the days and nights of rescue and recovery. Norick was born in Oklahoma City and graduated from Oklahoma City University with a B.S. degree in management. 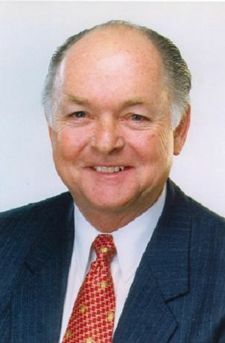 Known as a dedicated public servant and strong civic leader, Norick served as mayor of Oklahoma City from 1987 to 1998. Often referred to as the “Father of MAPS” and credited with Oklahoma City’s renaissance, Norick’s leadership inspired the passage of the Metropolitan Area Projects temporary one-cent sales tax in 1993. Norick is controlling manager of Norick Investment Company, LLC. He previously was employed by Norick Brothers, Inc. for more than 30 years, serving as president of the company from 1981 to 1992. He is chairman of the board for Sport Haley, Inc. and serves on the board of directors of BancFirst Merlon International, Inc.
Norick serves on the board of trustees, executive committee and is the chairman of the investment committee for Oklahoma City University. He is vice chairman and on the executive committee for the State Fair of Oklahoma, chairman of the Oklahoma City Riverfront Redevelopment Authority, vice chairman of the Oklahoma Industries Authority, member of Committee of One Hundred and chairman of Oklahoma City Downtown TIF Review Committee. See pictures of Ronald J. Norick and other media HERE.